My new BFF: the stick. I tried to come up with a clever alliteration in keeping with catchy phrases like Instagram’s ever popular “Throwback Thursday”, but I’m not motivated enough to pull out a dictionary and there just aren’t that many W adjectives on the tip of my tongue. Speaking of tongues, I forgot how much I love Pringles original! I’m munching on them now and it’s really killing my chances of losing another 10 lbs before our family pictures, but they’re just sooooo good! 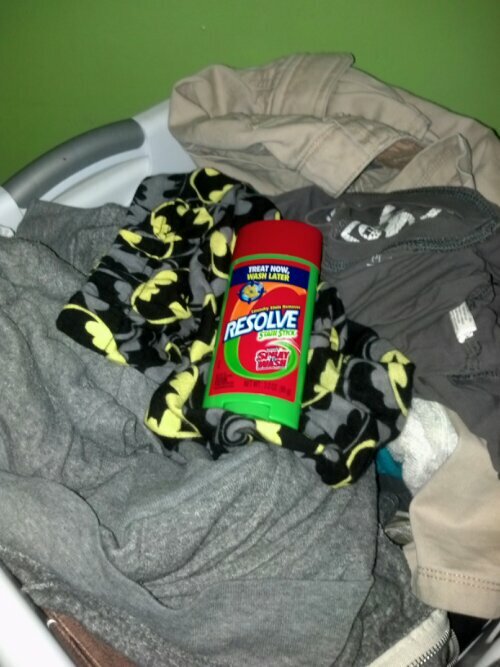 I never thought much about stain removers before Nathan was born. It was so rare that I needed one and my Tide pen seemed good enough (if it didn’t dry out in between uses). Then…babies. Spit up. And oh my word, baby food. The stains only multiplied as the years went on…self feeding, dirt, grass, marker and *shudder* – red sauces. The problem that I found with each one that I tried was the same – I either had to have a load of laundry ready to go in so I could treat and wash immediately or I had to remember to set the item of clothing aside to treat at a later time. Fail, fail, fail. I know it sounds silly, but life is crazy sometimes and I just couldn’t seem to get the hang of it and ended up with a lot of ruined shirts. And then one day, something magical happened. Resolve Stain Stick! Rub it in, toss it in the laundry basket and wash it whenever. I swear I heard angels singing the first time I used it. I went through an entire stick, using it at least once a week (it last about a year) and was impressed over and over again. Then one day the unthinkable happened. It ran out. Yep…I now have three stained clothing items of Nathan’s that Tide could not conquer in the matter of a week! All is well though, I picked up a new one while grocery shopping today. It set me back $3-something, it’s probably a buck or so cheaper at WalMart, but I can’t live without it that long! So there it is, my way-too-wordy shout out to one of my favorite products.